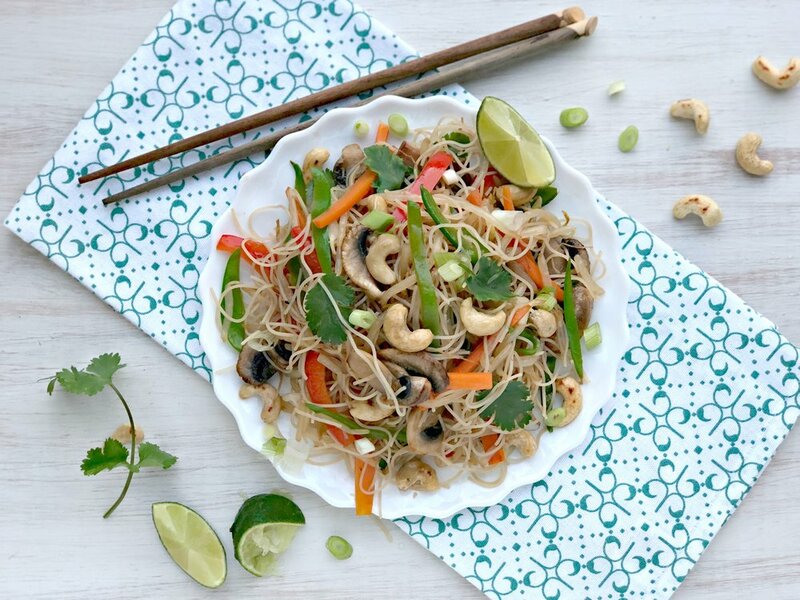 This cashew chow mein is made with rice noodles instead of egg noodles which makes it vegan friendly. It's super easy to make and is so delicious with lots of crunchy cashews and fresh vegetables. I use the packets of ready to eat rice noodles from supermarket because they're so much quicker & easier than dried rice noodles. You can swap the vegetables in this veggie chow mein for any other vegetables, as long as they cook fairly quickly. I julienne (finely cut into batons) all the vegetables as it speeds up the cooking time and improves the flavour of the chow mein. In the largest frying pan you have, toast the cashews on their own for a few minutes until they are golden brown, shaking the pan frequently. Keep an eye on them the whole time as they can burn quite easily. Tip the toasted cashew nuts out of the pan and onto a plate to use later on. Heat the oil in the same frying pan and add the chillies, garlic & ginger. Stir fry for 30 seconds before adding the pepper, mangetout & carrots. Stir fry for 3-4 minutes before adding the mushrooms. Cook for a further 2-3 minutes until all the vegetables are golden. and slightly soft. Add a tiny splash of boiling water if they are sticking to the pan. Add the beansprouts and rice noodles and stirfry for a further 3 minutes until piping hot and the beansprouts are soft but still have plenty of bite. Drizzle over the soy sauce and honey and give everything a really good stir before serving, making sure everything is very well combined. Serve immediately, garnished with lots of fresh coriander and spring onions, with lime wedges and extra soy sauce on the side. This dish doesn't hang around and is best eaten as soon as it's made. You can re-heat it and have it for lunch the next day but it won't taste quite as good.